I debated a lot about this post. Do I just go for the flashy birds or subtle beauty? I decided subtle beauty will be another post for another day. This is a list of the must see flashy colored birds of Minnesota that even a non-birder would find beautiful. The Northern Cardinal is easy for many people in Minnesota to take for granted. I hear the males singing every spring day when I step out my back door. I think of them as such a common bird that it is easy to forget they aren't even found everywhere in our state. Interestingly though, they are pushing their range further north and are not as rare in Northern Minnesota as they once were. A good reminder as to how incredible this bird really is came when I was down in Arizona doing some birding at the Boyce Thompson Arboretum. I had an incredible day of birding adding lifers left and right. There were hand fulls of hummingbirds and even a Vermilion Flycatcher. At one point we saw a group of very excited birders standing on a small foot bridge. We meandered by and asked what they were seeing. 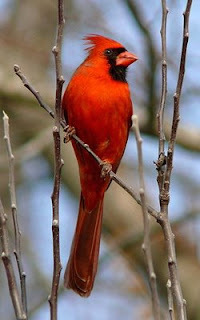 "A Northern Cardinal!" they shouted with glee. We shrugged our shoulders and continued on. They were from the Pacific Northwest and the cardinal was a real rarity for them. I try not to forget that while it may not be rare where I live it is still a spectacular bird. The males are a beautiful red with a nice crest and the black on their face adds an interesting contrast. Just like the blue jay, if this were a bird I'd spotted on a rare visit to a tropical locale I would probably be shouting and cheering just as those people on the bridge were. This is a beautiful bird. Now then, if you have read this far you probably disagree with at least one of my picks. 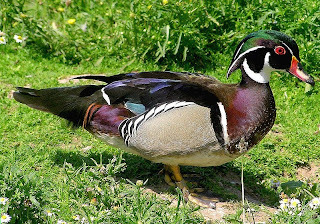 You probably think I hugely overlooked your favorite bird. Please feel free to leave other ideas in the comments section but...if you're going to suggest another bird then you have to also tell me which species it would bump off the list. This is a fun idea. I'll have to give some thought to my own list. 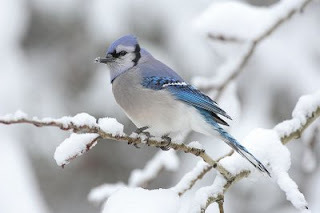 I've always found Blue Jays beautiful too, but often overlooked. Your choice of the Blackburnian is spot on. It's my favorite warbler. 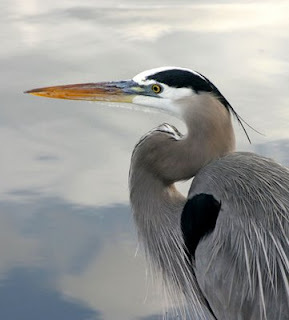 I do think I'd swap out the Goldfinch for a Magnolia Warbler and I'd kick out the Heron for a Black-throated Blue. Penelope: good suggestion but which one would you take off the list? Coming up with new birds is easy, deciding which ones to take off is harder. Lynne: Both good suggestions as well. The reason I didn't do more warblers was that I was trying to stick to more common birds that anyone visiting the state could see. I actually felt a little bad having the Blackburnian in there since they are hard to find. What? No raptors? The saw-what got robbed! I would agree with your list. I have even been fortunate to see all but 2 of the birds on your list, the red headed woodpecker and the Blackburnian warbler. I only saw a scarlet tanager and indigo bunting this year for the first time and only once, but they were marvelous. I also agree about the undreratedness of common birds. I love blue jays. I like cardinals too, but I have begun to appreciate the subtlety of the femal more than the brightness of the male. Shaz: I'm thinking I may do a 10 most unnoticed beautiful birds or some such thing. As I said in the post, the idea on this one was to come up with the ones even non-birders would appreciate. If I do the other list it will include such beauties as the rusty blackbird and certainly some raptors. I'm open to suggestions and bribes. 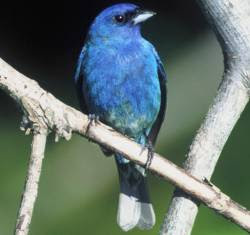 I have had a chance to see the indigo bunting at my feeders a couple of days ago. It is truely a beautiful bird to see. Congratulations. They are awesome birds. 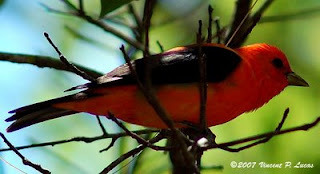 I saw my first of the year Scarlet Tanager this afternoon but no sign of Indogo Buntings yet. WHAT BIRD IS THIS? Hello, I hope you can help. I was traveling on US212 from Montevideo to Granite Falls on Friday evening where the trees were beautiful shades of green and every bend in the road revealed a new vista of valleys, hills, and variances of green. 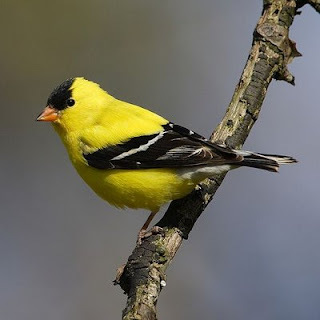 As I came around a bend, just at a guard rail in the middle of the road I saw a bright yellow bird standing near another which was injured; it flew up as I drove by. Immediately as I passed it landed again by its friend and flew up again as the car behind me passed it. I did a u-turn and returned to the scene. Again the bird was there and again it flew away as I approached. I pulled over. When traffic allowed, I went to the middle of the road and picked the dead bird up and moved it off the road where it's friend could return safely to pay its respects. I was moved not only by the behavior of the bird to its deceased friend (or mate?) 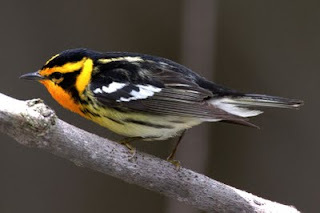 but also by the beauty of both birds; mostly bright yellow (entire body) with gray or brown wings, but I especially remember it's long black or grayish beak which narrowed almost straw-like to, sadly, a drop of blood at the tip. I didn't' take a picture out of respect and honor for these beautiful creatures but later tried to find the type of bird that these are and so far I am unable to do so. What do you think? Hard to say without a photo or an idea of the size. Was it larger than your hand? Pam size, very small? My first guess based on an all yellow and grey wings would be a prothonotary Warbler or maybe a blue winged Warbler. Check out those. Fun post of yours for us to read ! Thanks!